ORLANDO, FL (Laserfiche)—October 17, 2011—Laserfiche (booth #1113) today announced that it will enable attendees at Gartner Symposium/ITxpo 2011 to participate in a live HD video conference with 10 senior Laserfiche strategists, product architects, software engineers and IT executives throughout the event. Attendees will have the opportunity to ask questions about everything from how to deploy enterprise content management (ECM) as a shared service to developments in the Laserfiche product roadmap. 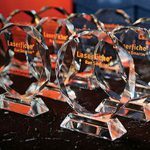 “Gartner ITxpo attendees will have unprecedented access to the best and brightest members of our software development, product strategy and leadership teams, allowing them to rapidly assess the benefits Laserfiche would bring as part of their overarching IT infrastructure,” said Brian LaPointe, Vice President of Strategic Solutions at Laserfiche. In addition to the ongoing video conference at the Laserfiche booth (#1113), Laserfiche will also deliver an in-person educational session on Monday, October 17, at 3:30 pm in Oceanic 3. Presented by LaPointe, “Leading from the Front with ECM as a Shared Service” will explore how CIOs who use ECM to deploy shared services such as case management and A/P processing enable optimal resource efficiency and service performance—not just in one or two departments, but across the enterprise. Visit booth #1113 to engage with senior Laserfiche personnel, pick up a copy of “Agile ECM as a Shared Service” and see a demo of Laserfiche Mobile™, a new iPhone app that allows organizations to quickly extend their mobile strategy without sacrificing governance controls. 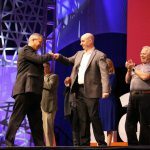 Gartner Symposium/ITxpo is the IT industry’s largest and most strategic conference, providing business leaders with a look at the future of IT. For more than 10,000 IT professionals from the world’s leading enterprises, Gartner’s annual Symposium/ITxpo events are key components of their annual planning efforts. Attendees rely on Gartner Symposium/ITxpo to gain insight into how their organizations can use technology to address business challenges and improve operational efficiency. For more information, please visit https://www.gartner.com/technology/symposium/orlando/index.jsp.